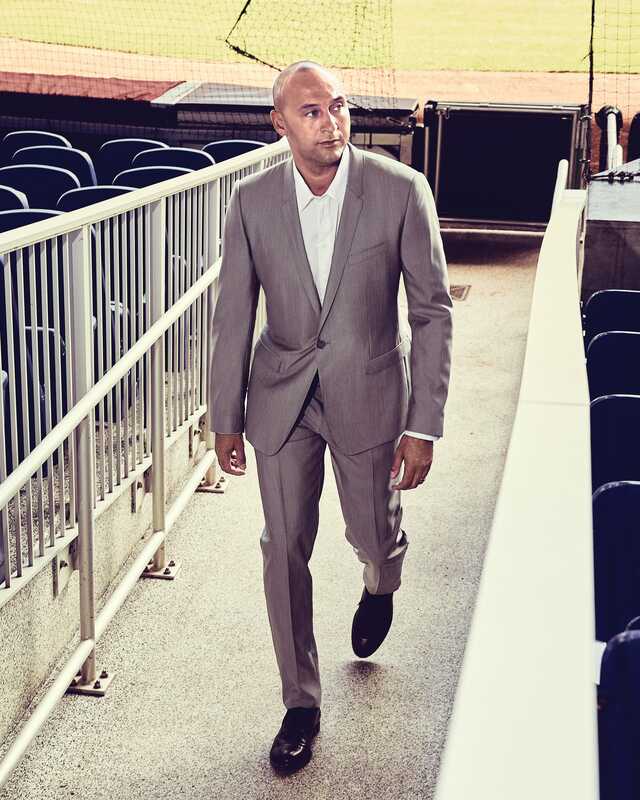 Derek Jeter arrived in Miami on a mission: to challenge himself in a new role while turning around a losing team and reviving a sport on the decline. A year later, it's all starting to come together. Suede bomber jacket, $798, by Polo Ralph Lauren, and New Ace leather sneakers, $580, by Gucci, both at Saks Fifth Avenue, Dadeland Mall; twotone jumper, $540, by Neil Barrett, and slim jeans, $650, by Balmain, both at The Webster, Bal Harbour Shops. 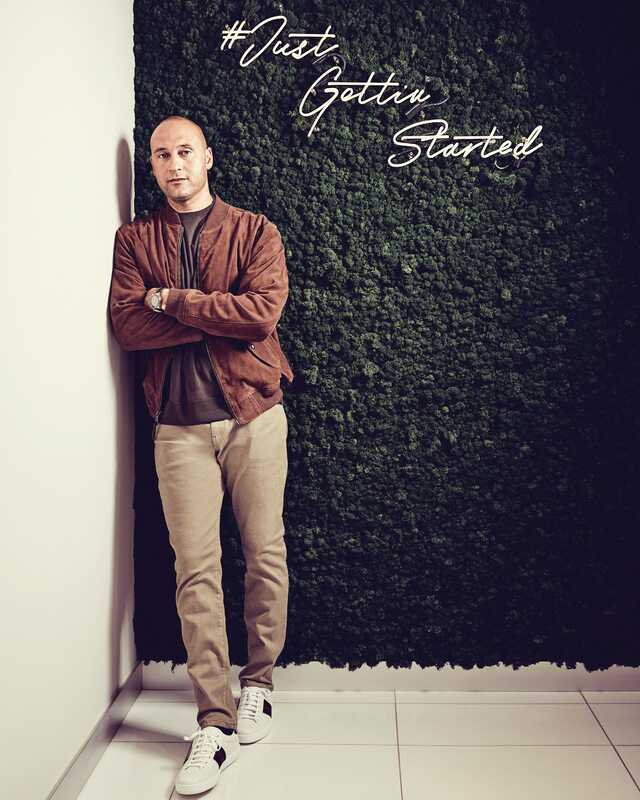 Two-piece wool suit, $2,675, at Dolce & Gabbana, Bal Harbour Shops; solid buttondown shirt, $245, by Armani Collezioni at Saks Fifth Avenue, Dadeland Mall; shoes, Jeter’s own. Why do you think you were given a hard time for making changes to the roster this season? 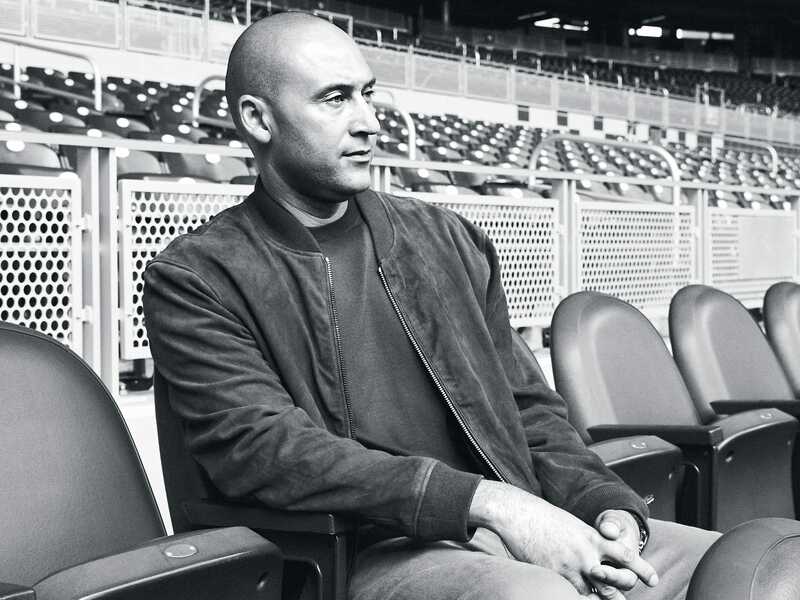 DEREK JETER: There’s a complicated history here with the fan base. [The Marlins] won a championship in ’97; they dismantled the team. They won in 2003; they dismantled the team. They built a new park; they dismantled the team. We’re going to make changes that are at times uncomfortable and unpopular, but we’re making changes to something that wasn’t working. How does it feel to lose games through this transition? How is it different from losing on the field? DJ: In some sense, it’s much more frustrating than as a player, where you get a hit or you don’t; you make a play or you don’t. Here, you have to look to the future and make decisions not only on that particular day, but for the future of the organization. So you have to have a lot of patience. As a player, you have to have a short memory because you have to learn to deal with failure. But also as a player, you can affect an outcome of a game. In the position I’m in, you can’t because you’re just watching. Is there an equivalent to athletic training in terms of leadership skills? DJ: I think you can learn. You take bits and pieces from people you have been fortunate enough to be led by. DJ: No question. He, in my mind, is one of the greatest owners in all of sports. He is the epitome of preaching accountability. Throughout my entire career, I felt as though every single game I was playing was to keep my job, and that’s how everyone should feel. He was very, very passionate about winning. That’s what came first and foremost for him. We had a lot of similarities. That’s why we got along so well. DJ: I’m here from 8 in the morning until the end of the day. And on game nights, I’ll run home to visit with Bella, then back here until 10:30pm. What are your impressions of Miami? DJ: I love the diversity in Miami. Is that what influenced you to institute Spanish classes for the front office? DJ: To me, it’s important that not only our players who come from Latin America learn to speak English, but that our American players learn to speak Spanish. So if that’s the case, we also need to learn Spanish in the front office. Furthermore, we’re building an academy in the Dominican Republic for our Dominican players. The commitment to the Latino players feels social equity-driven. DJ: It’s an idea I’ve had for a long time. I always felt as though people expect Latin players who come here to answer questions in English, which is unfair in my mind. People don’t realize how difficult it is to come from a foreign country and just get dropped in the United States and be expected to compete at the highest level and, at the same time, communicate at that level. That’s not easy. Did your upbringing in an interracial family instill in you an awareness of the experience of minorities? DJ: No question. I was always taught to connect with everyone. You should have friends from different backgrounds and nationalities. It’s not like you had to go out and necessarily have five black friends, five white friends, five Hispanic friends. You surround yourself with good. You want to win rings, but how important is it that this team also wins over Miami? DJ: We want this to be Miami’s team. Sports has a great way of doing that: Anytime you win, you see all the rallying around that particular team. I don’t think this community has the trust for this organization. I understand that. And like I said, I can’t expect everyone to trust me if they don’t know me. How are you revamping the ballpark experience? DJ: We have to capture the energy and diversity of Miami inside this ballpark. With baseball, part of the plan has always been [to position] the stadium as an entertainment venue. A lot of people come to a game and don’t know who won or lost. Some of them don’t even know who we’re playing. But they know if they had a good time. If you weren’t doing this now, what would you be doing? DJ: I don’t think like that. I set my mind on doing what I want to do, and as long as I work hard, that’s what’s going to happen. Since I was 5 years old, I wanted to be a shortstop for the New York Yankees. Nothing ever creeped in my head besides that. And then I put my mind into ownership, turning this organization around and making it something Miami’s proud of. You have to have that level of tunnel vision. So that’s what’s going to happen.